Christmas was celebrated at the Lithuanian social Club by an annual visit of ‘Kalėdų Senis’. ‘Eglutė’ [Christmas Tree] often took place just after the New Year, within the 12 days of Christmas. As many travelled to the venue by bus, this avoided days without transport and did not spoil Christmas at home. The programme was always the same. A ‘warm-up’ with singing and then the arrival of the man himself. He would sit down for a rest while the children took turns to recite a poem, sing a song or show off in some other way. Without this you would not be sure of a present. At the end of the performance, out would come the presents from the sack. Every child also received a bag of monkey nuts, sweets and a mandarin. 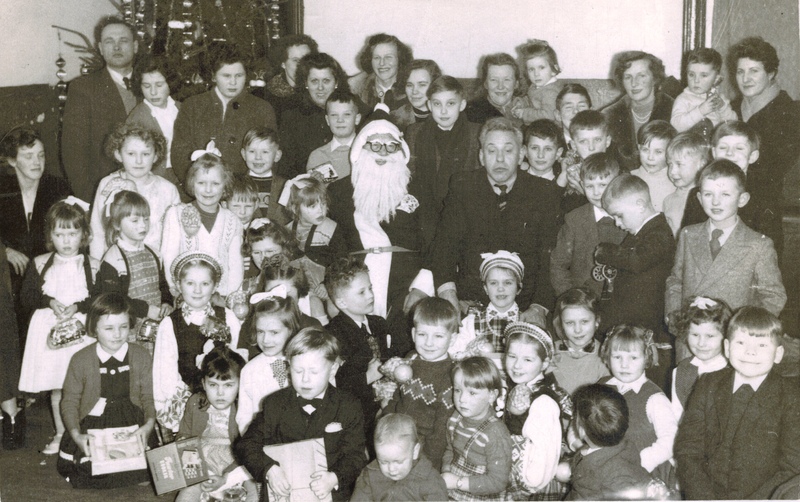 This picture from 1957 has Aleksas Kuzmickas as Santa next to Domas Dainauskas who was our teacher (Lithuanian classes every Sunday) and led the programme. This entry was posted in History 1948-2000 and tagged Christmas, Eglute, kaledos. Bookmark the permalink.